A bobcat sits on furry haunches atop a rocky knoll surveying his grassy domain with casual feline regard, sniffing the air at nothing in particular. On the higher ridge opposite, a mother coyote and her young pup stop to look around, then scamper down and out of sight under cover of brush. Overhead, a cloudless cerulean sky buzzes with the avian antics of prairie falcons, kestrels, red-tailed hawks, and golden eagles. In the valley below, a herd of deer graze peacefully, while a kit fox paws at the ground and trots away triumphantly with a meal dangling from her jaws. 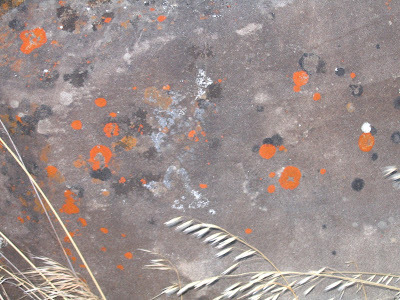 On a hillside abloom with purple needlegrass, silver lupine and fiery orange poppies, industrious ground squirrels have dug out batteries of tunnels, which they share with burrowing owls, lined up like a row of wise sentinels with eyes sharpened on the lookout for a hapless vole. Somewhere a mountain lion stalks and lies in wait. Condors, antelopes and grizzly bears might appear. 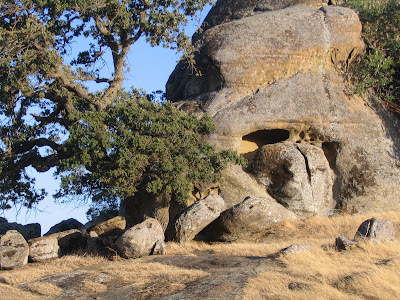 In the sheltered sanctuary of a guano-splattered rock overhang, a group of Central Valley Yokuts, or perhaps Delta Miwok, or more local Ohlone native people, gather in ceremony to paint ancestral symbols, dance the ritual stories of creation, pray to gods and spirits, and congregate as one to witness the sacred transition of seasons at the longest day of the year. 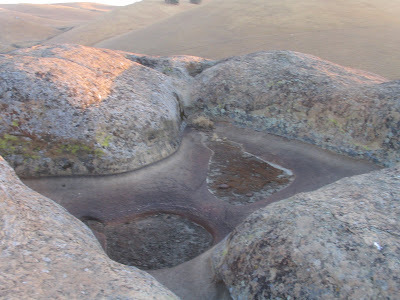 Life scenarios such as described above have unfolded for thousands of years at this special place in far eastern Contra Costa County, near Byron, northeast of Livermore, and about 40 miles east of Berkeley, in a land that, were it not for a carefully managed resource plan that allows for occasional visits by human beings, has all but been forgotten by time and civilization. Here, you can stand alone on a rocky promontory, lost to the world, eyes closed, and gaze into the infinite beyond, feeling infused with the ancient vibe of timelessness, at one with the eter nal ebb and flow of creation, in synch and harmony with the undisturbed, natural rhythms of life. This is a place that literally blows you away! 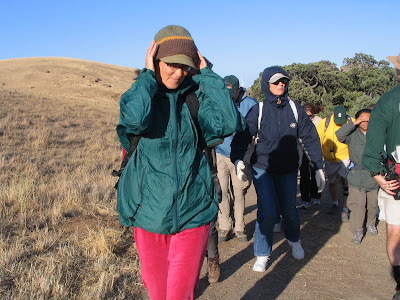 On a naturalist-led guided tour on the final day of Spring, a group of twenty-two irrepressibly enthusiastic nature lovers brave unrelenting gusts of 30 mile per hour winds for the unique opportunity to walk among spectacular sandstone boulders, admire grassy hillsides dotted with venerable Valley oaks and California Buckeye trees, and take in otherwise off-limits high desert-like vistas overlooking four of California's nine distinct land forms, providing a stunning visual reference point for one of the East Bay's, and perhaps one of California's, most unusual ecosystems and precious natural resources -- the 775 acre Vasco Caves Regional Preserve. 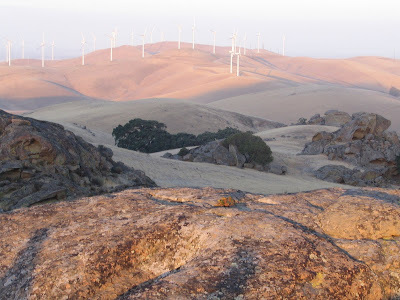 The ecological island, surrounded as it is by development, watershed lands, ranch lands, and vast tracts of wind turbines, exists in its own time and place, left alone all these years except for the scientifically and well-thought out land management practices to help restore certain pristine features. One account written by an elderly woman reminisces about having had the run of the place back in her youthful day – the forties? - when it was just a big backyard playground and she took everything for granted and now rues modern times when everything has to be restricted. 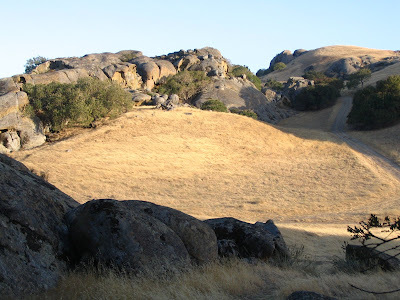 The appeal, and prec isely why it's restricted, is that isolated specimens of flora and fauna survive here, including rare and endangered species such as the red-legged frog, tiger salamander, western toad, and the San Joaquin kit fox. Adding to the aura of mystique worthy of the extra measures to safeguard Vasco Caves is its status as archaeological treasure trove -- grinding stones and mortar holes abound, where acorns and buckeye meal were ground; tool-making workshop sites exist, where occasionally flints and arrowheads and scattered pottery shards can be found; and, most notably, fragile, barely discernable pictographs decorate walls in tucked away alcoves, ico nic representations of ancient creativity, probably the only surviving or known examples of Native American rock art in the immediate Bay Area. 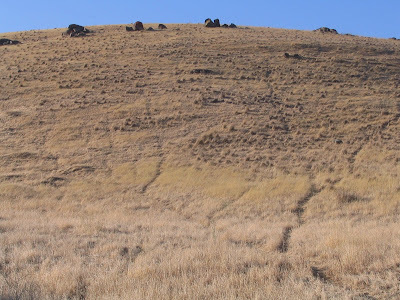 Archaeologists have concluded from forensic evidence that people have been active at Vasco ever since humans have been in California, dating back to about 8,000 to 10,000 years ago. 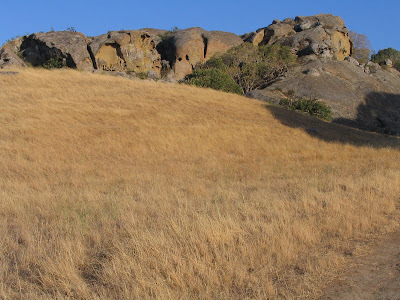 According to our affable guide, Mike Moran, a naturalist with the East Bay Regional Park District, "a lot comes together right here at Vasco Caves" - convergences of history, geology, geography, botany, zoology, ecology, and prehistoric archaeology. 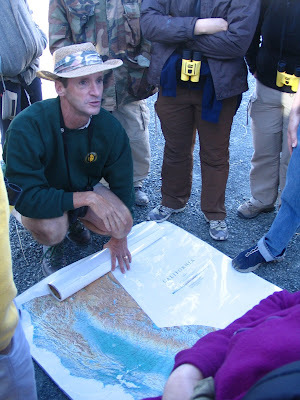 Before setting off, Mike gathers the group together and pulls out two large laminated maps (topo and linguistic) to spatially orient us and give a short lecture on what to expect. With the wind whipping ferociously, we duck behind the bus for a respite, and from the looks on some of the participants’ faces it’s obvious that some did not come prepared for the raw elements. If it weren't for the raging wind, it would be a spectacularly perfect evening. Well, it is anyway, despite the wind. Finally, at about 6:30 pm, with crisp rays of sunlight bathing the eastern views in golden hues, and casting warm shadowy effects all about, we set off down the tra il into this strange, never before seen world existing just a few hills over from Vasco Road. Considered one of the most dangerous stretches of highway in the Bay Area, the road was built as a concession by-way when Los Vaqueros Reservoir was built. It was never meant for so much traffic (as commuters from two counties use it and drive, cell phones in hand, like maniacs), and many fatal accidents have resulted mostly from cross-overs. 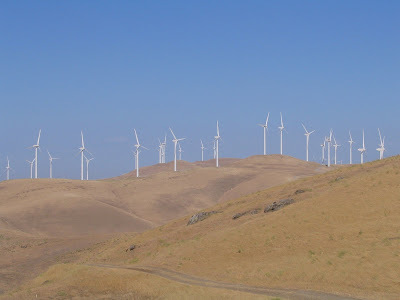 Vasco Caves also happens to be within view of the somewhat unsightly, somewhat disturbing bird-killing wind turbines of the Altamont Pass Wind Research Area. And yet, despite....it's an amazing sensa tion to be sandwiched in amongst all this and still get the feeling of being smack dab in truly remote, wind-swept, rugged, ancient territory. Along the way, at various spots of interest, mostly out of the wind, Mike stops and points something out -- a tree, a plant, a feature of the landscape, a dead snake, a buckeye, sheeps’ bones, an old well -- and holds forth knowledgably on everything that makes Vasco Caves such a one-of-a-kind experience. 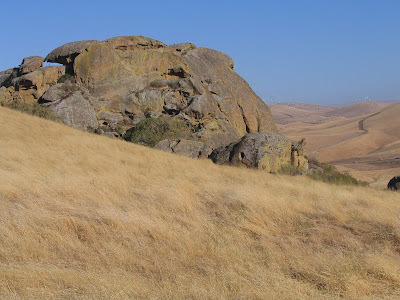 We learn how grazing management practices help restore native grasses and increase raptor habitat; about the large nesting p opulations of golden eagles and burrowing owls; and have a “wow” moment when Mike tells us that Yosemite Miwok peoples have stories about the Vasco Caves. “Look around you,” he exhorts with a sweeping gesture, “what do you see?” He is specifically pointing to a shallow depression with tule reeds growing in abundance. 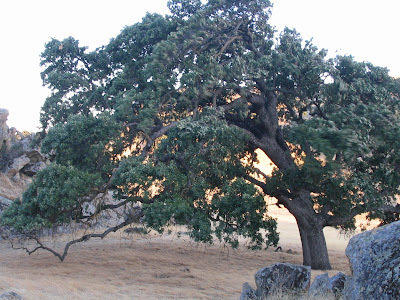 “How can it be,” he asks, “that water-loving plants can thrive in such a seemingly arid environment?” Same thing goes for the big cottonwoods and the 100+ year old Valley oaks, he explains, thirsty trees which require year-round access to water. The answer, Socratically rendered, turns out to be a conundrum of geology: the preserve is a very subtle water dependent ecosystem where plants exist and thrive in harsh conditions owing to ground water that is forced to the surface from far away by complex subterranean activities that somehow push it to this area. A real miracle, he says, one of several which make the preserve so special, and allow so many different species of wildflowers, trees, and large and small fauna to call this place home. Otherwise, scanning the lay of the land, there don't appear to be any natural drainages or water flow channels (missed by creek-lovin' Gambolin' Man? why no permanent settlements we re established here? ), so unseen groundwater, wells, springs and vernal pools are truly life-giving gifts provided by Mother Nature for her many creatures. We walk on, the wind just pummeling us - I turn and strut backwards, a locomotor feat that proves to be a major improvement, but no one else catches the cue, instead trudging with heads down, and jackets turned up against their faces, causing them to miss out on so much of the scenery, also making it difficult to follow Mike's ad lib discourses. Looking about, I'm charmed by animated hillsides swaying with knee-high grasses; tree tops bending and swooshing to the will and whip of the Aeolian forces. 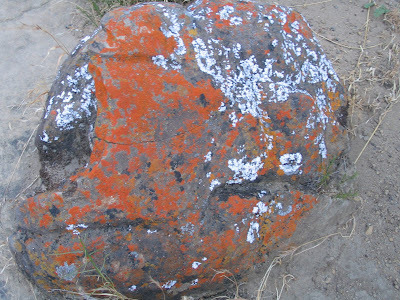 We stop next to a beautiful outcrop of boulders tinged in chartreuse yellow algae and splotched with vermillion red lichen patterns, situated in a picturesque hollow like a Georgia O'Keeffe mirage. We gawk at and snap photos of the fortress-like bulk, while Mike tests out the group's Rorschach quotient at every turn – see who can spot what in the sculptural contortions of the wind-carved formations. Someone sees an eagle's beak, another person spots a manatee, someone else a badger. I see Valley of Fire like elephantine figures and other fanciful forms. 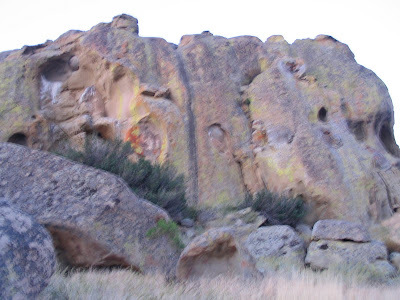 It's easy to understand why native peoples worshipped such rocks and anthropom orphized them as gods and spirit beings. We walk on - it's a very leisurely pace we're moving at, covering all told no more than two or three easy miles - and Mike continues to regale us with tidbits of this and nuggets of that. We learn about the expansion of native bunchgrass on the hillsides, owing to the grazing of sheep that eat the non-native foxtail grasses. Mike points to a distant copse of trees high on a ridge and notes they are the northernmost stand of Palmer Oak, an uncommon desert mountain species of Quercus generally found at altitudes of between 2300 and 4300 ft. and known fo r its large acorns and hollylike spiny leaves. 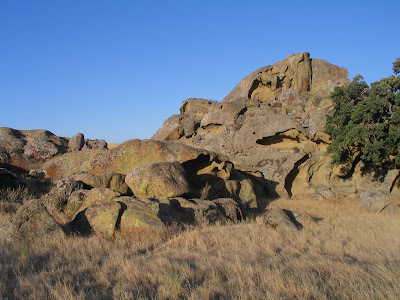 At another outcrop of colorful rocks jumbled in a mass thirty feet tall pockmarked with holes, solution pockets, and alcoves where cliff swallows make their nests, Mike decides to test our knowledge of geology....how did these boulders get here? What caused their existence? Why haven't they eroded to dunes of colorful dust? 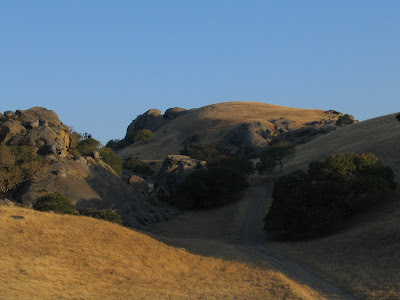 The answer to these questions, we find out, is 50 million years ago an ocean covered the Central Valley to the foothills of the Sierra Nevada and over eons of time, it drained, receded, filled, and dried up, laid down sediment, and meanwhile the same tectonic forces at work that uplifted and created nearby Mt. 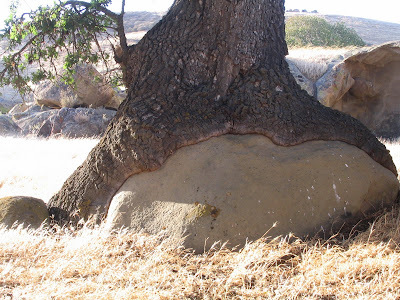 Diablo also worked to thrust up bedrock through malleable sandstone and push it to the surface, tilting it angularly and moving it along the fault lines. 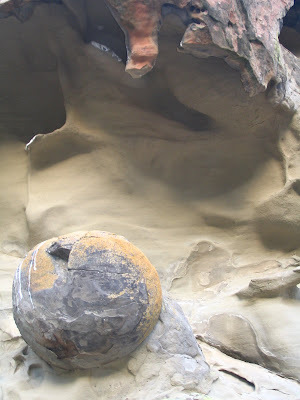 Differing minerals tended to bind together in what are known as concretions - and the rocks were thus - uh - set in sto ne – making them resistant to weathering, and slowing the erosion process way down. 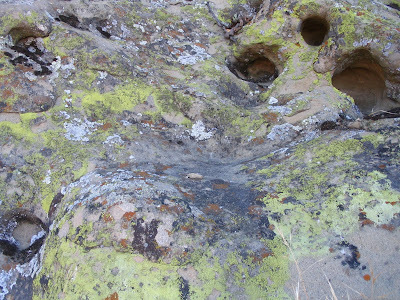 Some of the concretions take on shapes resembling hoodoos, spheroids, cannonballs, and other odd-looking, whimsical configurations decorating the rock walls like artistic works of sculpture carved by an unseen creative hand. 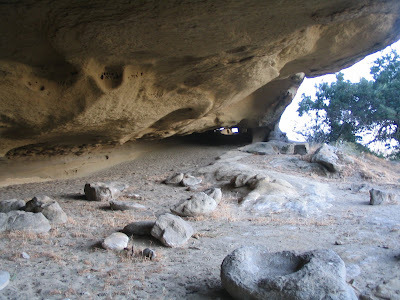 Vasco Caves, like nearby Round Valley, Mike tells us, is believed to have been an ancestral gathering place for tribes from all over the region where people passing through would come together to trade, meet in council, socialize, have fun, gamble, rest up, and move on. There is no archaeological evidence of permanent settlements. 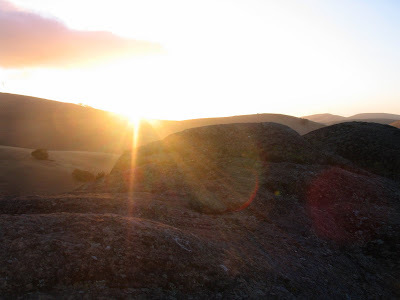 It's also believed to have been – and continues to be for their descendants - a harmonic convergence / Solstice Site, a place that held – and continues to hold - special significance for those who came - and come - to celebrate and meditate. 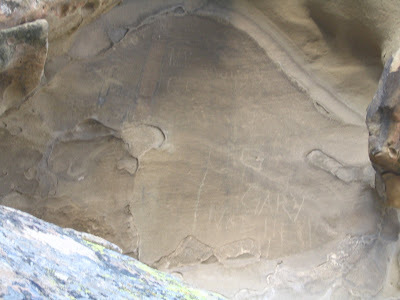 For the ancient ones whose spiritual leaders – shamans and medicine men – conducted sacred hunting and harvesting rituals and healing ceremonies in the shadows of the big rocks and giant oak trees, the caves held special, mystical meanings, as caves everywhere have, representing as they do passage to the underworld. 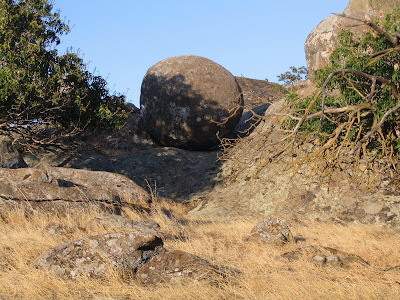 Though not technically caverns or grotto type caves, these wind-carved boulders still must have been treated with the respect accorded any great cathedral or place of worship. The p aintings on the walls, while pretty underwhelming, but no less remarkable for their very existence, leave open to interpretation the messages being conveyed – crosses, spirals and bird figures. There is no doubt magico-religious significance centered around the activity of pictographic art creation – attempts to symbolically represent and bridge the gap between the spirit and material worlds, perhaps, or invoke spiritual connections between human and animals to gain an edge in the mojo of hunting them. Who knows? And how many painted figures and symbols do we not see, that have been rendered invisible by the ravages of wind and rain? Even years of cattle grazing, when they would rub up against wall surfaces, could account for their disappearance and extreme scarcity. We'll never know. Nor will we ever know what the imputed messages were meant to convey. All we can do is revel in their unknowable antiquity, muse over their titillating mystery. 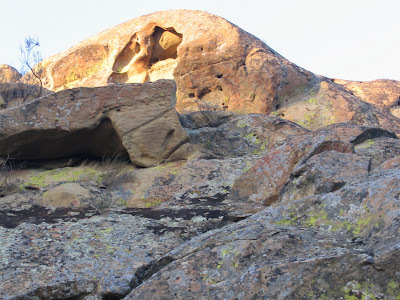 The sun was due to set at 8:32 pm, so from the pictographic panel we make our way up about 100 ft. along a single-track thread of a trail through chaparral and small boulders, with alpenglow sun light filtering down on the backdrop of big boulders, lending them an almost religious aura. It's a beautiful time of evening to be cresting the high point, atop a 75 ft. high bluff, sandwiched between looming Mt. Oso behind us and imposing Mt. Diablo to the west. We are approaching the vernal pools. Owing to their seasonality, they are bone dry, but still quite photogenic and interesting geologic features for their shapes and functions, harboring as they do (when filled with water) assorted amphibious creatures and Longhorn fairy shrimp, odd little inch long 11-legged crustaceans found only in a few other locales. During dry periods, the sh rimps' eggs, called cysts, go into an extended hibernation, and are capable of withstanding heat, cold and prolonged desiccation, before awakening to life with the coming of rains. More miracles of nature. 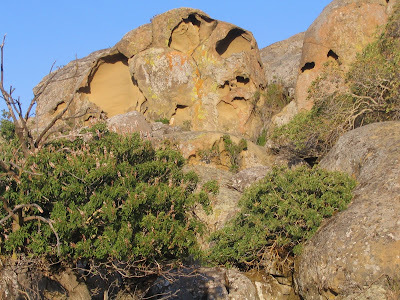 The absence of notable surface water at Vasco Caves leaves it up to the imagination to picture these tinajas (shallow depressions in sandstone rocks that collect water) brimming with and then overflowing with water creating ephemeral gushers cascading down the sides of the rocks. That would be a sight to behold! Each season brings with it its own charms and surprises, though, and today, it's a dry and burnt auburn of a Sum mer Solstice day, marking one of the most mystical days of the year, celebrated around the globe at Solstice hot spots by thousands of animistic pagan earth worshippers, and some normal folk, too, no doubt, gathered together this evening to look, admire, wonder, offer up some silent prayer or invocation. As the sun filters behind a huge cumulus cloud, coloring it pale lavender and orange, Mike elaborates some more on the topic at hand - that Vasco Caves was probably a Solstice Site for the ancient ones, a place they visited to experience the mystical energy evoked by the sun's overhead passage from east to its trajectory of setting perfectly in the west between the twin massifs of sacred Mt. Diablo. . .a time when prayers were heard and the barriers between the spirit and material world dissolved, facilitating passage into the great beyond, the nether/otherworld. At a perfectly timed moment, the sun dips below the horizon, casting Tuyshtak in fiery tones, and, if just for an illusory moment, the crack between two worlds opens....and I am mesmerized by a sense of timelessness, rebirth, connectedness, and age-old belongingness to something intimate and personal, but beyond the ken of human understanding.